In the future, the world has been segmented into 12 Districts. All Districts work in different areas to serve a repressive Capital - led by President Snow (a brilliant Donald Sutherland). In the past, the Districts rose up against the Capital - a battle that they lost at great cost. To remind them of this loss and to ensure their future compliance, President Snow organises a yearly event - The Hunger Games. Two children from each District are selected and then forced to fight against each other in an arena until only one remains. It feels pretty redundant to say that this film is good - really good. Unless you have been living under a rock, you will be well aware that this film has been both a critical and box office success. Based on the trilogy of books by Suzanne Collins, The Hunger Games movie series is now three quarters of the way through with the fourth and final film due out this November. These films are now proper event movies where even the release of a new trailer prompts much excitement and discussion. 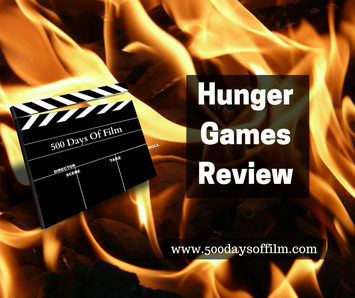 Unlike the last film that I reviewed, Wild, I hadn't read The Hunger Games books when I first saw the film at the cinema. In fact, I had no idea at all what the story was about. I was just happy to join a very good friend at the cinema. Thinking back, this was such a rare experience and one that is unlikely to happen again. Nowadays, I read film reviews, listen to film podcasts (my favourite being the BBC's weekly Kermode and Mayo film review aka wittertainment) and watch film trailers. Will I ever enter the cinema with no clue as to what I am about to watch? I doubt it. Will you? I loved The Hunger Games then and I love it now - I must have watched it four times. The movie tells such an interesting story and it gripped me from start to finish. The film features one of my favourite film characters - Katniss Everdeen (Jennifer Lawrence). Katniss volunteers to enter The Hunger Games after her sister, Primrose, gets chosen. She then has to use all of her skills (and develop new ones) in order to survive. Having now seen her in Winters Bone, I appreciate that, from the outset, Lawrence has been capable of a strong and nuanced performance. However, I had never seen her before The Hunger Games and she, and the character that she portrays, was a complete revelation to me. It felt like well past time for cinema to present such a tough, capable, female lead and a fantastic role model. If you haven't seen The Hunger Games, I would wholeheartedly recommend that you do. I certainly left the cinema with a racing pulse! Having gone into this film with no idea of its plot or source material, I then devoured all of the three books in the series! Lovely to see Woody Harrelson in a role I actually enjoyed after Rampart.